Bluetooth doesn't work. What's wrong? I’ve been using my Librem 13 for about two weeks now, and today I wanted to pla some music over Bluetooth. 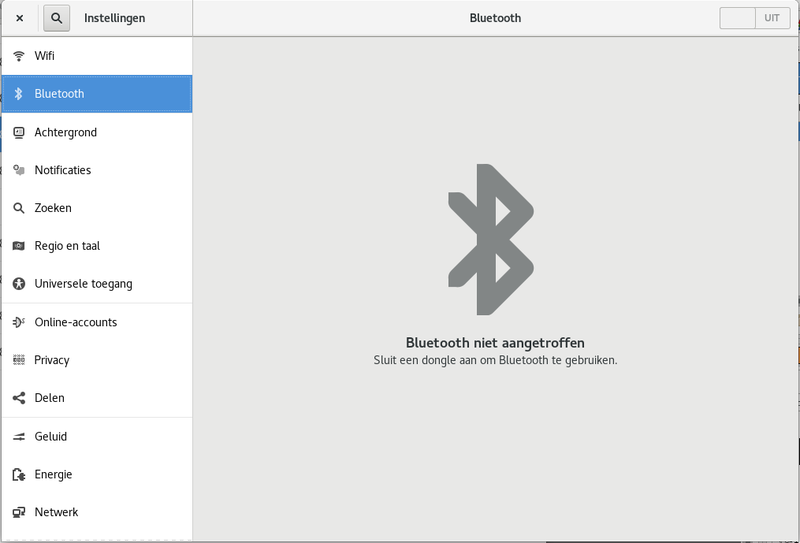 The hardware switch for wifi and bluetooth is enabled (wifi is working fine), but the settings screen for bluetooth says that no bluetooth is detected and it suggests to connect a bluetooth dongle. I pasted a screenshot of the bluetooth screen below. It’s in Dutch but I guess it shows a bit more what I see. Does anybody know what’s wrong? Do I have a hardware issue or do I need to load some drivers? All tips are welcome! 1 Add the non free repo. After the driver has been installed, switch the wifi/bluetooth hardware switch off and on, and then it works. I just followed your instructions and bluetooth worked fine afterwards. But I realized that mac address spoofing of the Wifi card did not work any more. So since I prefer spoofing my mac address over bluetooth, I purged the atheros firmware afterwards. does not list it any more. How can that be possible? i’m trying to add the repo, but i’m getting a Permission Denied message. Sudo did not work. any suggestions? did you try sodu su? can I please ask how did you purge the ahtero firmware? is it just a question of removing the non-free from the sources.list?